Lately, I’ve been on a rice pudding kick. 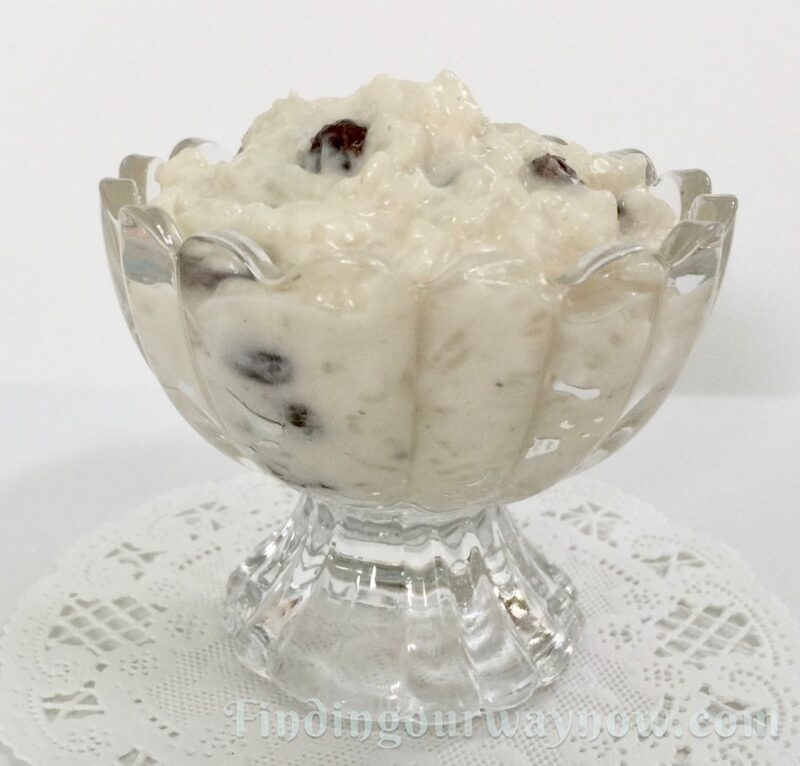 There are many recipes for rice pudding, such as my slow cooker version. 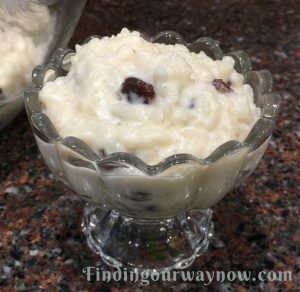 However, a quick rice pudding is perfect when you find yourself with a lot of leftover rice and in need of a quick dessert. More often than not I would make way more rice than I needed just to have leftover rice for this wonderful comfort food dessert. The beauty of this base recipe is adding a condiment of your choice can vary the flavor. You can make as soft or as firm as you like by cooking it less or more depending on your taste. 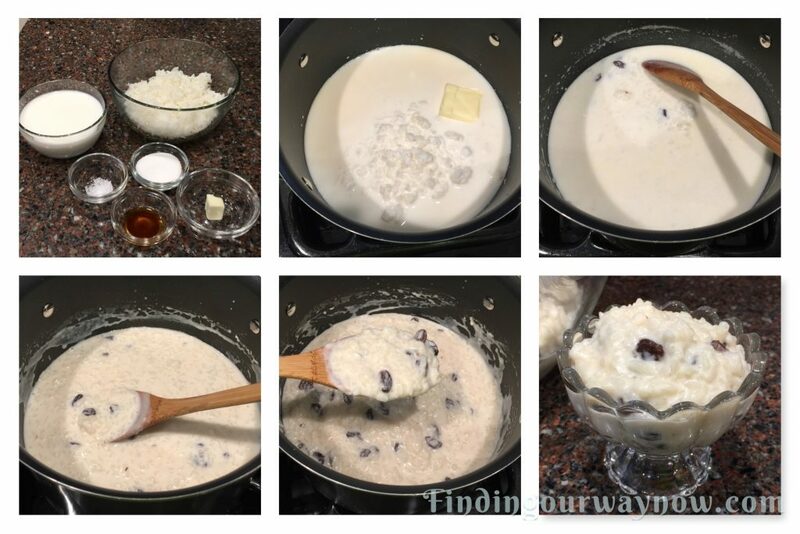 As far as what I add to this basic recipe if any; I always go for the traditional version by adding raisins. Garnish: whipped topping, cinnamon & nutmeg. Optional: Others possible additions listed below. Combine the cooked rice, milk, sugar, butter, vanilla, and salt in a 3-quart saucepan. If desired add an additional ingredient of your choice listed below. Cook over medium heat, stirring continuously until the mixture starts to thicken, about 10 to 15 minutes. Remove from the heat when you reached your desired consistency. Allow it to cool a bit. Ladle the rice pudding into dessert dishes. Sprinkle with cinnamon and nutmeg. If desired, add a dollop of whipped toppings and enjoy. Additions/Variations: Other then raisins, listed below are a few suggestions to vary your pudding a bit. Have some fun and experiment. Notes: As it is with many recipes this recipe can be doubled or halved depending on your need and the amount of rice you have on hand. The texture of the rice will change the pudding. The stickier the rice, the more it will melt into the milk. The drier the rice, the more texture you’ll see and taste. If you prefer a softer pudding, then simply cook the rice pudding less. The more you cook the rice milk mixture the firmer the pudding will become. One thing to keep in mind is the rice pudding will firm up more as it cools. 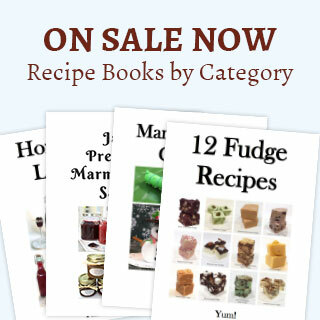 You can leave your quick rice pudding plain, or add something to it for a bit of interest. Some will vary the flavor of the extract to complement one of the additions below. The point is you can make your quick rice pudding to your liking. Cooking Rice: Makes approximately 3 cups of cooked rice. Thoroughly rinse the rice. In a medium saucepan with a tight-fitting lid, combine the rice, water, butter, and salt and bring to a boil. Stir a few times, cover, and reduce the heat to low. Allow the rice to simmer for about 15 to 17 minutes. Check to rice at 15 minutes. If you see little steam holes, it’s ready for the next step. Keep covered and move the pan off the heat. Let it stand covered for 10 minutes to finish steaming. 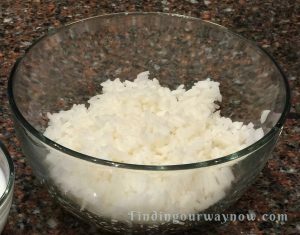 Remove the lid and fluff the rice with a fork and allow it to cool. Serve or use it immediately, or place the cooked rice in a container and refrigerate. Now you have two ways to make rice pudding, slow cooker, or on the stovetop. Both are just as good. Both can be varied in the same way. Either one you choose to make will be just as good. Have fun and make it the way that makes you smile.